From this tutorial you’ll learn how to customize Animated Box JetElements module style for Elementor. 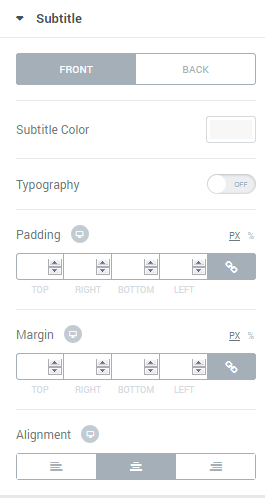 Here you can switch from customizing Front to Back Animated Box settings. Just click on the button Back to proceed to customizing the back side of the Animated Box module elements. Height — here you can select the height value (in pixels) for the animated box module. The height is the general parameter for the front and back sides of the Animated Box. Background Type — in this block you can choose, whether you want to use classic or gradient type for the animated box background. The customization options vary for each type. Color — here you can set the background color for the animated box using color picker tool. Color — here you can set the background color for the module using color picker tool. Border Type — here you can define the type of the border you need to use for the animated box. vertical — here you can move the shadow vertically (from top to bottom). Here you can switch to customizing Front and Back Icon. To switch to customizing them you need to click on the corresponding button. Icon Color — here you can select the color to use it for the icon. 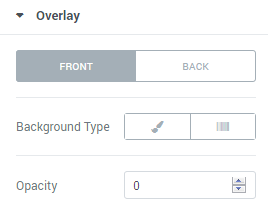 Background Color — in this block you can set the color to use it in the icon background. Font Size — here you can define the value of icon size in pixels. Box Size — in this block you can input the value for icon box size (in pixels). Alignment — here you can define the preferable icon alignment. The icon can be placed to the left, to the right, or remain centered. Title Color — here you can define the suitable color for the animated box title. Use color picker tool to select the necessary color. Subtitle Color — here you can define the suitable color for the animated box subtitle. Use color picker tool to select the necessary color. Size — define the font size of the animated box subtitle. Family — here you can set the font family for the subtitle. Transform — here you can choose from the dropdown menu, if you want the subtitle to be shown in uppercase, lowercase, capitalize or normal way. Line Height — in this field you can set the height of the subtitle line. Alignment — here you can define the preferable subtitle alignment. The title can be placed to the left, to the right, or remain centered. 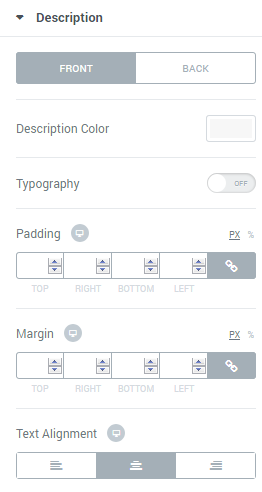 Here you can switch from customizing Front to setting up Back Description. To do it click on the corresponding button. Description Color — here you can define the suitable color for the animated box content. Use color picker tool to select the necessary color. Here you can switch from customizing Front to setting up Back of the Action Button. To do it click on the corresponding button. Background Color — here you can define the suitable color for the animated box button background. Use color picker tool to select the necessary color. Text Color — in this block you need to select the preferable color for the button text. Typography — turn the option on to view the typography settings. They are similar to Description Typography options. 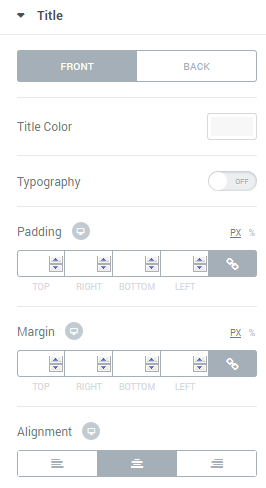 Border Type — here you can select the type of the border from the dropdown menu. Opacity — in this block you can choose the opacity for the overlay. In this block you can define the preferable order of elements displayed in the animated box. 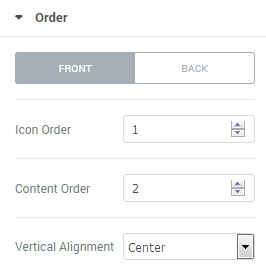 Input the order number for each of the elements in the required fields to create your custom elements order.